The Miracle on Grass is perhaps not the most well known moment in football history but it is nonetheless highly significant for the impact it had on British football. 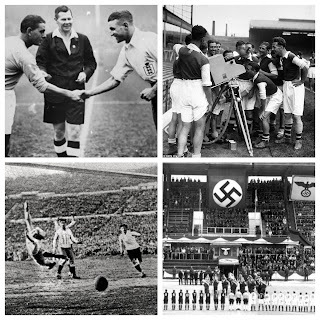 As Part Three remembered, the World Cup began in 1930 but the home nations did not enter. This was also the case in 1934 and 1938 too before the horrors of World War Two put football on hold and life into perspective. However, come 1950, England were ready to be part of this global spectacle. They had long been the team to beat, considered the fathers of the sport they were the scalp all sides wanted to take. 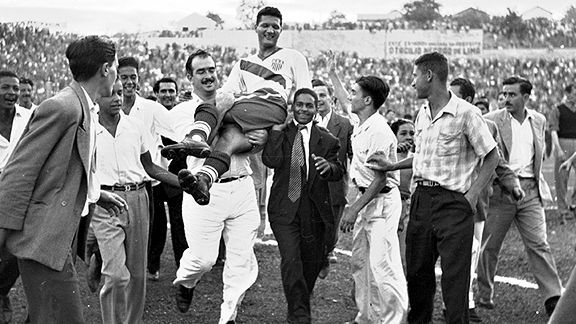 World Cup 1950 was held in Brazil and England were drawn in the same group as USA, Chile and Spain. England beat Chile 2-0 and next up were the USA. The USA, what threat were they? Well that was certainly the general consensus! So on 29 June 1950, at the Estadio Independencia in Belo Horizonte, infront of 10,000+ spectators, the stage was set for Walter Winterbottom's England to waltz past the part-timers USA. US coach Bill Jeffrey summed up the feelings pre-game: "We have no chance...[we are] sheep ready to be slaughtered." Classic England incoming eh? The favourites dominated the early stages of the tie, US keeper Frank Borghi making plenty of saves to keep it goalless. Then, in the 37th minute, a long range effort from US midfielder Walter Bahr was deflected into the back of the net by a diving header from forward Joe Gaetjens. The crowd was sent into raptures! The USA held onto their lead to win 1-0 and England was sent into shock. The Birmingham Daily Gazette called it 'A black day for England' and the Nottingham Evening Post called it an 'Unbelievable defeat'. To make matters worse, England would then lose to Spain three days later and be dumped out of their first World Cup. England were not the kings of football... It was a big wake up call! We have written in greater depth about the Miracle on Grass here. This whole article isn't an England bashing, but it just so happens that our next moment also involves them being brought back to reality again. This game is often labelled as the 'Match of the Century', so it is certainly worthy of inclusion! The Hungary side of the 1950s are a favourite for both Football History Boys, the Magical, Mighty Magyars led by their 'Galloping Major', war-veteran Ferenc Puskas (read about him here). This Hungarian team had won the gold medal at the Olympic Games of 1952 and arrived in England on 25 November 1953 on a run of 24 unbeaten matches. Yet again though, classic England... The Magyars were less fancied because of their differing tactics to the expected norm and because England had never lost on home soil to a side outside of the British Isles. So there we go, the stage was set that November day, 105,000 fans at Wembley Stadium. 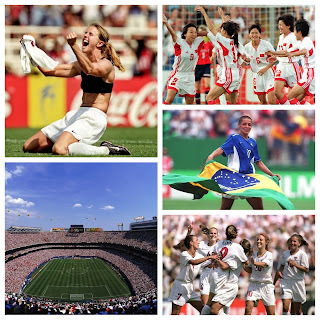 The intriguing, Olympic champions v the orginators and self-proclaimed greats of the game. 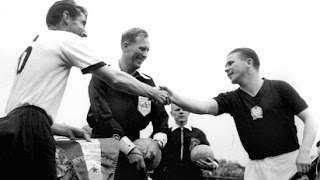 Stanley Matthews, Stan Mortenson and Alf Ramsey lined up for the hosts whilst Ferenc Puskas, Sandor Kocsis and Zoltan Czibor started for the Magyars. England's usual WM formation v Hungary's inventive 4-2-4. It took just 1 minute before things took a turn for the worse for Walter Winterbottom's men as Hungary took a 1-0 lead. Jackie Sewell levelled after 13 minutes but in the space of 7 minutes the Magyars turned the game firmly in their favour - Nandor Hidegkuti (20') struck his second of the match whilst Puskas netted two of his own (24', 27'). Mortenson managed to nab a goal just before half-time but at the break the visitors led 4-2. The second 45 followed the same format as the first, Hungary dominated in every aspect of the game as they took a 6-2 lead by the 53rd minute - Hidegkuti grabbing his hattrick. Whilst future England boss Ramsey did score a consolation penalty it was not enough to turn the tide of the match. Hungary had torn the English apart, 35 shots versus England's 5, slick passing football that left jaws dropped. The Daily Mirror the next day highlighted how Hungary were 'Masters of the ball, of position, of movement'. The aftermath saw six England players never selected for the national side ever again and changes were made because of the extent of the defeat. England were once again taught a lesson by the footballing world. 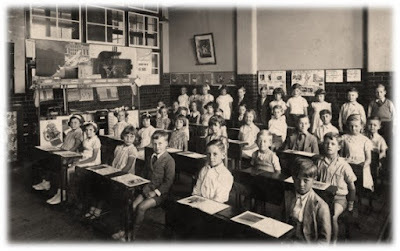 "We completely underestimated the advances that Hungary had made, and not only tactically. When we walked out at Wembley that afternoon, side by side with the visiting team, I looked down and noticed that the Hungarians had on these strange, lightweight boots, cut away like slippers under the ankle bone. I turned to big Stan Mortenson and said, 'We should be alright here, Stan, they haven't got the proper kit'"
The match above details how in the early 1950s, the Mighty Magyars of Hungary were the most watchable, exciting and innovative side in Europe. They arrived at the 1954 World Cup in Switzerland hoping to secure a global title that would write them into the history books. As ever though, football does not always deliver as expected. 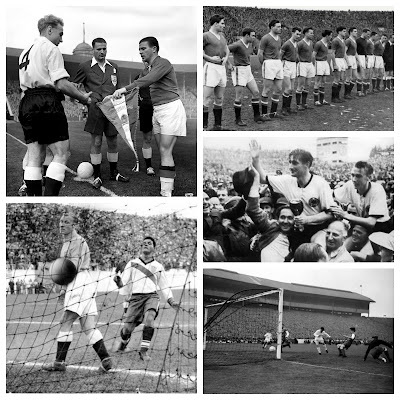 So as we've detailed, Hungary shook the British footballing world with the battering of England at Wembley in 1953. What we didn't mention though, was the stunning 7-1 victory in the return match 6 months later when England travelled to Budapest in hunt of revenge in May 1954. Puskas (who would go on to score 84 goals in 85 caps), Kocsis (75 in 68 games) and Hidegkuti (39 in 69) starred once more, Hungary were surely favourites for the World Cup that summer?! The Mighty Magyars waltzed through their group with a 9-0 opening win against South Korea, they followed this up with a magnificent thrashing versus West Germany 8-3. West Germany themselves would need a play-off victory against Turkey to secure their place in the Quarter-Finals. Devastatingly for Hungary, talisman Ferenc Puskas picked up a hairline ankle fracture in the victory against West Germany. However, this blow would not matter as they saw off a strong Brazilian team 4-2 thanks to a Kocsis brace. 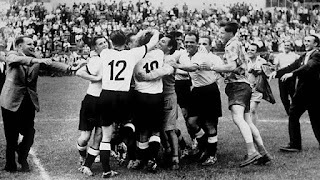 The West Germans, only admitted into FIFA in 1950 and still treated with some resentment following WWII, beat the Yugoslavs 2-0 in their last 8 tie, lining up Austria in the Semi-Finals. Max Morlock was the hero for the Germans as they put Austria to the sword 6-1 and earn a well deserved Final place. Hungary, still missing Puskas, faced off against a well fancied Uruguay side in a bit of a ding-dong battle. Hungary went from 2-0 up to drawing 2-2 after 90 minutes due to two late Uruguay strikes. Into extra-time they went... step up Sandor Kocsis again! The future Barcelona star netted twice in additional time to send the Magyars into the final that could make or break them as a 'Golden Generation'. That brings us to the 4th July 1954: West Germany v Hungary for the final of the World Cup in Wankdorf Stadium, Bern. Over 62,000 fans packed the stands in torrential rain to watch the 'Miracle' match unfold. 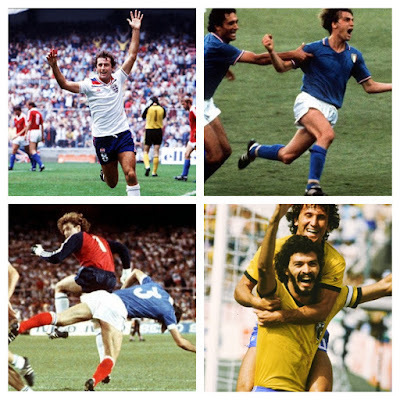 As TFHB's Ben put it in his article on the match: 'The World's greatest team, against the World's enemy. East vs. West. Capitalism vs. Communism'. 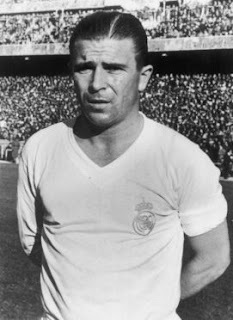 An unfit Puskas was included in the final line-up and justified his selection with the opening goal after just 6 minutes. Czibor added a second 2 minutes later and the Germans looked in trouble at 0-2 down. All was not lost though, the West Germans surprisingly struck back to make it 2-2 at the break, everything to play for in the last 45 mins of the World Cup. The Hungarians dominated the second half but stunningly, in the 84th minute, Helmut Rahn - West German Outside-Right - nicked the tie and shocked the watching world. Newbies West Germany had beaten the Magnificent Magyars, The Miracle of Bern! FIFA tell the story of the game, including the introduction of removable studs! Moment 19 is a terribly sad one, important nonetheless however. Nearly all football fans will know about the Munich Air Disaster of 1958, its impact not just touching British shores but also continental Europe too. On 6th February 1958, Manchester United football club were changed forever with what happened at Munich-Riem Aiport in West Germany. The plane that crashed attempting to take off in the snow that fateful day contained the famous Busby Babes. A side managed by the legendary Matthew Busby, recruited from the local area by scout Joe Armstrong and coached from a young age by Busby's assistant Jimmy Murphy. The Babes, average age of just 21 years old, won the First Divison title in 1955/56, 11 points clear of second placed Blackpool. They followed up the feat the very next year with a defence of their league title and the hopes of success in the European Cup to come. That winter's day of 1954, United had just beaten Red Star Belgrade of Yugoslavia in advance to the Semi-Finals of the European competition. Their British Airways plane had stopped in Munich to refuel and with snow falling, two take-off attempts had already been abandoned. The pilot that day decided another attempt in favour of an overnight stop, how that decision became costly. Skidding on the slush of the runway, flight 609 ploughed into a fence at speed. Heartbreakingly 23 of 38 passengers were killed in Germany. 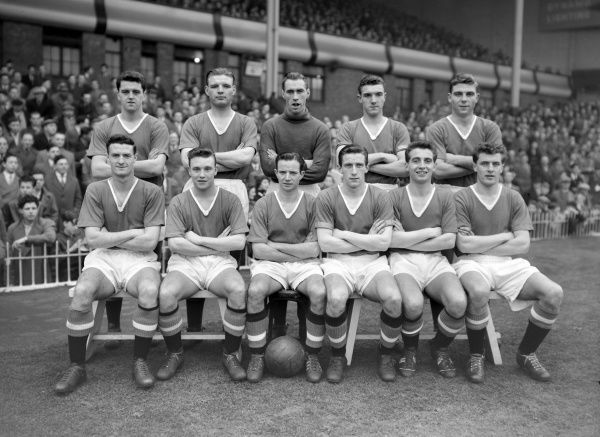 The Busby Babes ripped apart as Geoff Bent (25), Roger Byrne (28), Eddie Colman (21), Duncan Edwards (21), Mark Jones (24), David Pegg (22), Tommy Taylor (26) and Billy Whelan (22) all succumbed to their injuries. Additionally Jackie Blanchflower (24) and Johnny Berry (31) would never play football again. It wasn't just footballers killed as 3 club staff, 8 journalists and 2 other passengers lost their lives. Manager Matt Busby would survive and vow to rebuild the club (staying on as boss till 1969). He did this over the course of the next decade; but for Manchester United, it was the destruction of perhaps their best ever side and for the families of those killed and fans alike, it is a night that will never, ever be forgotten. The 1950s had been a decade of change, both within football but also in Europe in general, with nations working out their positions in world politics following the war, developments in social policy and a growth in desire for entertainment. This entertainment for many, would be satisfied by a love of sport and the European Cup played its part within that. The European Cup was a competition that had stormed onto the scene in 1955. We wrote about the birth of the competition that was initially the brainchild of French sporting newspaper L'Equipe. Jacques Goddet - the paper’s owner, as well as Jacques de Ryswick and Jacques Ferran - of the paper’s football section, petitioned the newly founded UEFA (June 1954) to organise a continent wide, annual tournament. In September 1955, 16 teams were entered for the first ever European Cup (minus English teams who were not allowed as it would 'distract from domestic football'). That very first version of it in 1955/56 was set up as a straight, two-legged knockout tournament. Real Madrid progressed 7-0 on aggregate over Swiss side Servette in the first round and then beat Partizan 4-3, whilst Milan beat West Germans Saarbrücken 7-5 and Austrian's Rapid Wein 8-3.That set up a mouth watering tie as the Champions of Spain took on the Champions of Italy in the Semi-Finals. 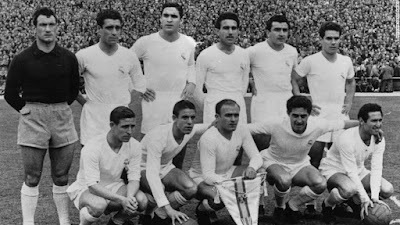 The first leg, at the Santiago Bernabeu, was won 4-2 by Real Madrid and despite losing 2-1 in Italy, Real were into the first ever European Cup Final. Stade Reims were the opponent and in a fantastic battle, Madrid were come out 4-3 victors thanks to a goal 11 minutes from time by Héctor Rial. We had our first Champions of Europe! In the following year Real Madrid would defend their title with a 2-0 victory over Italian side Fiorentina. This was made a hattrick of trophies by Real in 1957/58 with Milan left as runners-up, this time losing 3-2 after extra-time in Brussels. Year on year the tournament was expanded, 28 teams qualified for the fourth edition of European competition. Madrid stormed through the rounds again and once more Stade Reims were beaten finalists, just like the first season - this time 2-0. Alfredo Di Stefano had been Real's hero over the course of their victories, scoring in each of the four finals they had won. 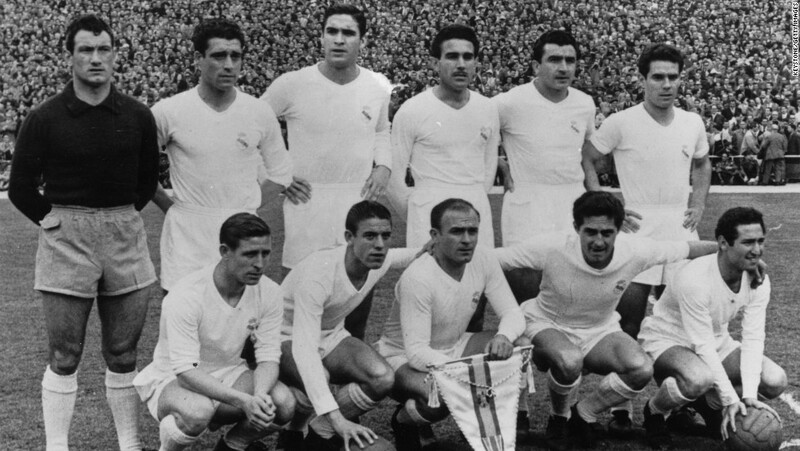 That brings us to 1959/1960 - Real Madrid attempting a fifth consecutive European Cup success. TFHB all-time favourite Ferenc Puskas (now 33) had joined Los Blancos in 1958 too, making them an even greater threat than before. The 1960 final would be held in Hampden Park, Glasgow; Real Madrid again making the final, but this time following a 6-2 aggregate decimation of rivals Barcelona in the Semis. Puskas netted 3 of the 6 whilst Di Stefano scored 2, Germans Eintracht Frankfurt awaited in Scotland in May 1960. With almost 130,000 spectators watching perhaps the best side of all time, Los Blancos did not disappoint. 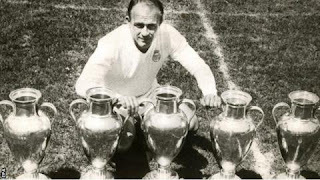 Di Stefano seized a hattrick that day whilst Puskas scored a remarkable 4 in the 7-3 thrashing. Real Madrid had made it five in a row, the European Cup was well and truly theirs!